Welcome to Kendo Nagasaki’s Healing website. Click the picture above to SEE THE VIDEO and PRE-ORDER this amazing book! These web pages comprise a “mini-website” dedicated to Kendo Nagasaki’s healing practises. At their foundation is the ideology of the ‘Medicine Buddha’, Yakushi Nyorai, a Buddha who embodies all the peaceful and Zen-based attributes of other Buddhas, but he also brings healing, and encourages all who need it to ‘fear not’. 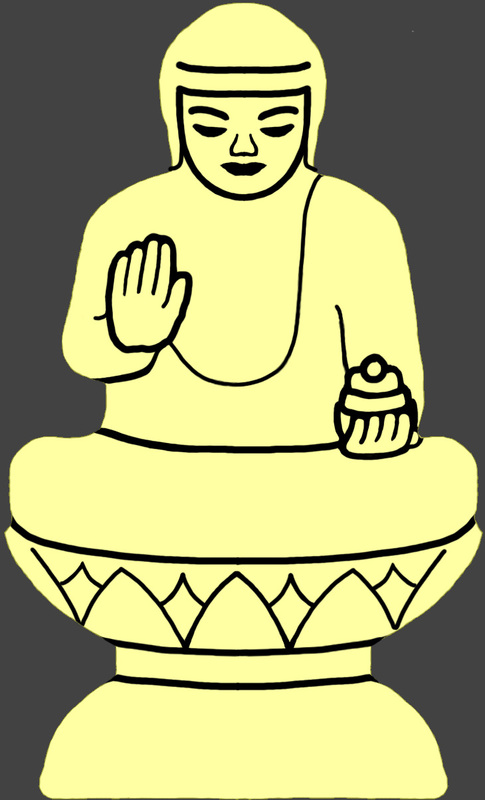 He is distinct because he holds a symbolic medicine jar, and his right hand is raised in a ‘mudra’, a gesture signifying an encouragement towards freedom from fear, and the achievement of peace – both necessary states for healing to occur. The background information posted here is fairly brief, so that new visitors can quickly gain an understanding of what Kendo’s healing is about, where it comes from, and what it can do; if you have come to feel that you might benefit from healing, you can see whether Kendo’s kinds of healing are something you would like to try. Firstly, Kendo performs what is known as Distance Healing, which involves sending spiritual energies to those who request healing from him, without them having to travel to The Retreat. Kendo has done this kind of healing for over 4 decades, and he continues to help many people in this way, often with remarkable results. Kendo also conducts small-group healing sessions in the form of Singing Bowl Healing at The Retreat, whereby seven people at once receive healing from the sound energies of singing bowls played intuitively by Kendo. This form of healing is gentle yet remarkably powerful, and is a sublime experience. If you need healing now, then please head straight to the How To Get Healing page, and your name will be added to the Distance Healing list. If you would like to experience Singing Bowl Healing, please keep an eye on the “News & Events” section for the date of the next session. In any event, if you have any questions at all about Kendo’s healing, please drop us a line, at healing@kendonagasaki.org. Kendo wishes you empowerment in all forms, particularly the empowerment of good health. All emails will receive an acknowledgment reply email, and a follow-up reply as soon as possible. holding his medicine jar in his left hand, his right hand admonishing us to “Fear Not”.